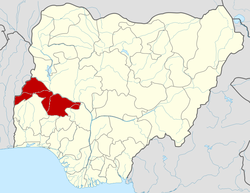 Kwara State was created on 27 May 1967, when the Federal Military Government of General Yakubu Gowon broke the four regions that then constituted the Federation of Nigeria into 12 states. At its creation, the state was made up of the former Ilorin and Kabba provinces of the then Northern Region and was initially named the West Central State but later changed to "Kwara", a local name for the River Niger. Kwara State has since 1976 reduced considerably in size as a result of further state creation exercises in Nigeria. On 13 February 1976, the Idah/Dekina part of the state was carved out and merged with a part of the then Benue/Plateau State to form Benue State. On 27 August 1991, five local government areas, namely Oyi, Yagba, Okene, Okehi and Kogi were also excised to form part of the new Kogi State, while a sixth, Borgu Local Government Area, was merged with Niger State. Drummers in Ojumo Oro, Kwara State. Important tourist attractions in Kwara State include Esie Museum, Owu Falls, Imoleboja Rock Shelter, Ogunjokoro, Kainji Lake National Parks and Agbonna Hill. Mineral resources in the state are limestone, marble, feldspar, clay, kaolin, quartz and granite rocks. The state has a federal university,The University of Ilorin, a state university that commenced in the 2009/2010 session and a private university, two polytechnics, three colleges of education, school of Health technology and school of nursing. It also has a navy school. Sporting activities are managed by the State Sports Council. The importance attached to sports led to the construction of a stadium complex. The facilities available at the stadium complex are mainbowl, indoor sports hall, hostel, recreational press center as well as an Olympic size swimming pool.